The family service at Wyvern. During this service there are two children’s sessions; Little Legends for those children who have not started school yet and Fire starters for children in Year R to Year 6. 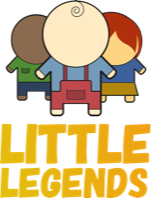 Little Legends is a place where children can learn and experience God through play. We have some super volunteers who will support and nurture your child on their journey with God. Our aim is for our little legends to feel valuable and gain confidence to thrive within this setting but also prepare them as they move to fire starters. Fire starters is a fast pace action packed service for children at Primary School. This is a place where children can develop their understanding of God in practical ways. Our aim is for our fire starters to continue to feel significant and to know that they have authority in God. Teddies is a parent, baby and toddler group held in the church extension every Tuesday during term time. The group meets at 9.30 and is known for being a fun and friendly place supported by a lovely team of volunteers, who are happy to serve and help in anyway. At 9.45 the group splits in two for a session of free play and a craft activity where there is also a snack. Then the next session involves singing and story time which parents and children enjoy together. There is a small fee of £1 per family. We have a supportive and energetic team who will help them explore what a Christian lifestyle looks like and how they can implement God’s love in their own lives.